My goddaughter in the picture is just over two years old. 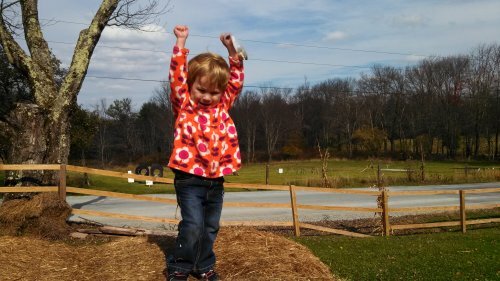 We had chosen to build the hay pyramid she is celebrating conquering because we wanted something kids could play on that wouldn't break or break down. So we put together some hay bales into a pyramid and watched kids happily climb up and down and up again all day long. No moving parts, noises, or lights. Just their imaginations and inexhaustible energy. The obstacle course you can see in the background was also built using reclaimed and scavenged materials.